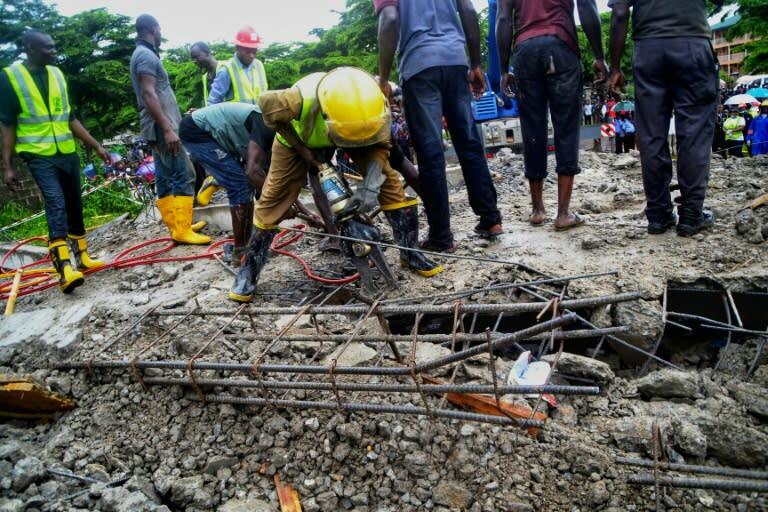 A half-finished building collapsed on Friday in the Nigerian capital of Abuja killing one person and injuring others. "My heart goes out to the family that lost someone today. There are no words to describe how you must be feeling," said Nigeria's vice president Yemi Osinbajo on his official Twitter account after visiting the site. The building in the Jabi area of Abuja had been used by traders who occupied the ground floor, according to an AFP reporter at the scene. A large crowd looked on as emergency personnel worked in the pouring rain to clear away mounds of grey concrete bricks with cranes and heavy equipment. "I was at the other side when the building collapsed. There were some people selling food and drinks at the ground floor. They are all trapped. I'm not too sure of the number," said Ahmed Musa, an unemployed graduate. Building collapses are common in Nigeria, where building codes are regularly flouted. In September 2014, 116 people including 84 South Africans, were killed in Lagos after a six-storey guesthouse connected to televangelist TB Joshua collapsed. The inquest verdict attributed the disaster to structural failures and said the building did not have planning approval. In December 2016, at least 60 people died after a church roof collapsed in Uyo, the capital of eastern Akwa Ibom state.